[Update: June 13, 2018] Gupo Market Dog Cruelty Case First Prison Sentence for Accessory to Violation of Animal Protection Act. This happened at the Busan Gupo Dog Meat Market at mid-day on August 17, 2017. The dog in this photo was tied with a metal pipe rope and dragged approximately 1km of distance for about 15 minutes. The dog screamed and yelped in agony, but it was of no use. His skin was peeled on the hot asphalt, but the abuser kept on dragging him, without blinking an eye. The perpetrator works at the Iseong Boshinwon (Health Food Shop) and this occurred when he was bringing the dog from someone who sold the dog to him. This dog died on the road and is believed to be used as meat for human consumption. Watch this TV news report about the Busan Gupo Dog Meat Market. The Busan government is doing absolutely nothing to stop this. Their only plan is to provide education for the dog meat workers to transition to another profession. The dog meat traders/butchers are wanting compensation like a retirement fund, but the government isn’t willing to pay them. While this is at a stalemate, dogs are still being horribly abused and slaughtered. Shame on Busan, Shame on South Korea for being backward, Indifferent, barbaric and lacking of compassion. Boycott South Korean products! Click HERE to call the Korean Embassy/Consulate General in your country. Click HERE to file petition with the Korean government on e-people. Click the video below to watch the instructional video by Susan Song on how to file a petition with e-people. Please watch this video: https://youtu.be/ad-swLg6_rA. The dog meat industry has yet again brought great shame to your city. As you are likely aware, last week a horrible incident occurred right in front of the Gupo Dog Meat Market in mid-day in plain sight of everyone. A man tied a dog to a metal pipe and dragged it down the street for over a km for a full fifteen minutes, all the while it helplessly flailed and cried out. Hundreds of bystanders, including children, had to witness this horror as its skin was peeled on the hot asphalt and it screamed and yelped in agony. The perpetrator works at the Iseong Boshinwon (Health Food Shop), and this occurred when he was bringing the dog from someone who sold the dog to him. This dog died on the road and is believed to have been used as meat for human consumption. This is disgusting and is an embarrassment to your city. Civilized people do not shamelessly drag helpless animals down the street tied to metal poles. We need you to recognize the barbaric nature of this practice which is unfortunately very common within the dog meat industry. Busan is your city. You live there. Your children live and go to school there. Can you be proud of this? Please listen to the pleas of your own citizens and bring an end to the cruel dog meat markets in your city. 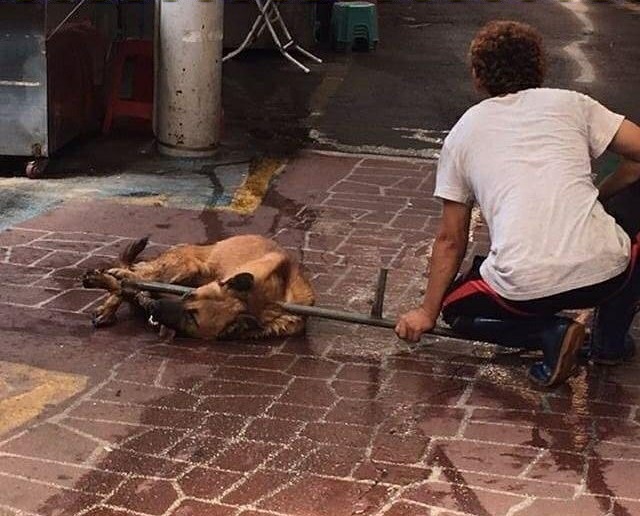 Click HERE to Sign: Boycott Busan International Film Festival – Hundreds of thousands of puppies are killed at the Busan Gupo Dog Meat Market every year! Click HERE to Sign: BIFF, we don’t want an award, we want your help – please show this film at your Festival! Send email to the Busan International Film Festival (BIFF) asking them to enter/show this video in their festival. Click HERE to sign Petition in Korean by CARE (Coexistence of Animal Rights on Earth). CARE, KARA, Dasom all have reported the abuser for the violation of Animal Protection Law and is collecting petition signatures to pressure their government to take action. 온라인 서명에 동참하며 한 마디 남기기 (Your Comment – Not required). 구포 개도살 피의자 고발 진행 상황 알려드립니다! 대로변에서 잔인하게 개를 끌고 가 결국 도살하여 공분을 일으킨 구포 개도살 피의자의 강력 처벌을 위해 동물보호시민단체 카라와 다솜은 지난 8월 24일 피의자를 검찰에 고발했습니다. 카라와 다솜의 고발에 의해 검찰에서 부산북부경찰서에 수사 지휘가 내려갔고 현재 수사가 진행 중에 있습니다. 잔인한 학대와 고통 끝에 생명을 죽음에 이르게 한 학대자에게는 반드시 응당한 처벌이 내려져야 합니다. – 피고발인은 파이프로 개의 목을 짓누를 때 왼팔로 파이프를 잡아 고정한 후 무릎을 쇠파이프에 올리고 개가 쓰러진 방향으로 몸을 기울여 온 몸의 체중을 파이프에 실어 개의 목을 조르고 있습니다. 개는 입을 벌린 채 새하얀 아랫 이빨이 보이는 상태이며 혀가 입 밖으로 나와 바닥까지 축 늘어져 있는데 그 색깔이 평소 개의 혀 색깔인 선홍색이 아닌 보라색 내지 흑색으로 전형적인 목졸림에 의한 질식 상태를 보여주고 있습니다. – 개의 혀는 사람보다 설질이 윤택하며 색깔이 밝으며 깨끗한 모습입니다. 개를 목매달아 도살하는 경우 혀의 색깔이 어둡게 변하며 목졸림에 의해 장기가 몰려 혀가 입 밖으로 나오는 현상이 벌어지며, 사진 상의 오차가 아님은 피고발인 하의의 붉은 색이나, 주변 간판, 의자 등의 붉은 색이 선명히 보이는 점에서 확인할 수 있습니다(증 제3호증 정상 상태에서의 개의 혀 색깔). – 동물보호법 제8조는 제1항 제1호에서 ‘목을 매다는 등의 잔인한 방법으로 죽이는 행위’를, 같은 항 제2호에서 ‘노상 등 공개된 장소에서 죽이거나 같은 종류의 다른 동물이 보는 앞에서 죽이는 행위’를 금지하고 있습니다. – 피고발인은 대낮에 많은 시민들이 이동하는 대로에서 개의 사지를 묶어 끌고 이동하는 등 차마 눈뜨고 볼 수 없을 정도로 잔인한 행위를 하였고, 나아가 누구나 볼 수 있는 공개된 장소인 노상에서 개의 목을 짓눌러 잔인하게 죽이는 행위를 하였는바, 이는 동물보호법 제46조 제1항에 따라 엄중히 처벌되어야 할 것입니다. Source: t-broad 부산뉴스, 동물학대 확산, 구포개시장 대책은 없나? This cruelty is beyond belief. How can you think your country can sit at a table of world leaders, but you let people on your home soil carry out these terrible crimes of cruelty of animals that are pets, love humans, want love from us. The fear you put in their lives is just unforgivable. STOP this cruelty NOW a person who believes in the afternoon life can not carry these cruel crimes causing terrible pain and suffering. Evil pure evil. Help STOP this terrible suffering. YOU ARE SO RIGHT IN YOUR COMMENT…HEARTBREAKING IN EACH OF EVERY MOMENT OF THE DAY…HOW PEOPLE CAN LIVE WITH SEEING THE FEAR & HEARING THE SCREEMS & CRIES FROM THE TORTURES I WILL NEVER KNOW OR UNDERSTAND !! Satan is running the entire world, this not only happens with dogs, this is happening to every animal in the world. Go vegan. What you are doing is evil and inhumane!! We boycott South Korea and China! Pray President Trump inflicts heavy taxes and penalties on all South Korea and China products. Shame on Busan, Shame on South Korea for being backward, Indifferent, barbaric and lacking of compassion. Boycott South Korean products! Never seen so much evil barberic animal cruelty in my life…it’s inhumane and must be stopped! The South Koreans, who perpetrate such atrocities by torturing and killing the dogs, consuming dog meat or turning a blind eye to such monstrous practices are disgusting, savage barbarians and completely unworthy of entry into the world community of civilized nations. Boycott them and treat them the same way we treat North Korea! Cats and dogs have been domesticated and our companions for thousands of years. Stop eating them immediately and protect animal rights. I will continue to boycott everything from South Korea including any visas until animal rights are created and enforced. My opinion of Korea & Koreans, in general, is at an all time low. I wouldn’t set foot there or buy any products from Korea, or even eat at a Korean restaurant in any city or any country. I am boycotting the country. It’s beyond disgusting. Since when was torturing any living creature okay? This is truly appalling, and there is no reason what so ever to treat any living thing,with such evilness and barbarity, Korea cannot be taken seriously if this behaviour is allowed to happen, how would the moron who did this like to experience it for even two minutes never mind a full fifteen, and what a beautiful dog too, What ever goes through the minds of such evil people? Shame on all Koreans who allow this, we will end this, one day. Primitive, backward, uneducated peasants still in the stone age.mindless, unfeeling, inhuman- ruled by similar. When will this evil work of the devil be conquered? stop consuming dog meat or any animal meat ,be vegan . This torture and madness must be stopped. Education and information is necessary so please spreading the word! Thank You! In nowadays doing this, to another life who by the way is the men´s best friends. Dogs are so friendly to people, there is no such thing as bad dogs, only bad owner´s. Dog and othere kind of animals only want peace, a home, love, nothing else…people love expensive cars, expensive houses, expensive clothers and so on…animals only want love. How…can anyone do this to animals. I best if someone did that to him he wouldn´t like. Absolutely disgusting and unnecessary torture. This needs to be stopped. Terrible people there are ..
What a disgusting country, what repugnant people/ monsters that allow this sadistic and diabolic cruelty!!! STOP torturing cats and dogs!!!! The whole world is watching your cruelty now. You cannot hide anymore!!! Please don’t kill and torture dogs and cats. STOP THE SUB-HUMAN, BARBARIC TORTURE AND CONSUMPTION OF DOGS AND CATS. WE BOYCOTT ALL SOUTH KOREAN PRODUCTS AND WILL CONTINUE TO DO SO UNTIL THIS SICK AND DISGUSTING ACTIVITY ENDS, PERMANENTLY!!!! THE EYES OF THE WORLD ARE UPON YOU AND THE OLYMPICS!!! COME OUT OF THE DARK AGES………. WILL YOU CONTINUE AS BARBARIANS OR JOIN THE CIVILIZED WORLD???? ?